A Lady's View: What do women really want? The word ‘perpetual’ connotes the romanticism of an eternity and while it takes truly long lived owners to discover that their perpetual calendars do require adjustment at least once per century, it takes nothing away from the fact that this, the most beautiful and functional of complications is high art and engineering combined. Indeed, the calendar aspect of time keeping as been so thoroughly overtaken by smartphones and laptops in our lives that I find IWC’s Ingenieur Perpetual Calendar Digital Date-Month a refreshing anachronism packaged in the futurist trappings of an Ingenieur case. First created in 1898 and taking the form of neck-worn caliber 97975 watch, this Patek Philippe innovation carried with it day, date, month and moonphases; this execution was to become a template for Perpetual Calendars to come; however, it would take slightly under 30 years before it finally took the form of a wristwatch and it wasn’t inventor Patek Philippe who popularised the complication, it would be the most unlikeliest of manufactures, the penultimate divers’ watch maker- Rolex. 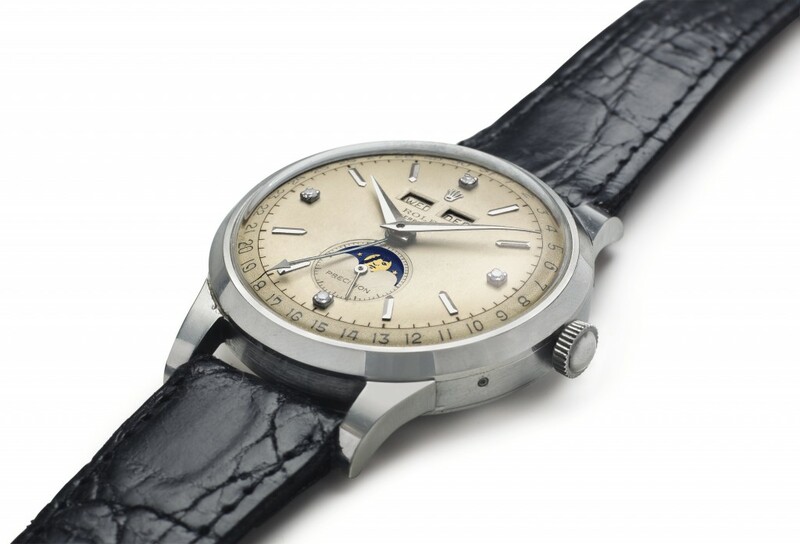 What followed soon after the 8171 was Rolex’s triple-calendar in the form of their signature water resistant Oyster case; the reference 6062 immediately mainstreamed the refined complication with its robust packaging, making it a watch that those lucky enough to afford one could wear regularly. From left: IWC wristwatch chronograph (1982) – Ref. 3710, Da Vinci Perpetual Calendar (1985) – Ref. 3750. Images: IWC. Da Vinci dial macro from European Watch Auctioneers. The IWC “Da Vinci” Perpetual Calendar Chronograph (Ref. 3750) was an epic statement of IWC’s arrival as one of the premier watchmakers of our generation. This was 1985 where typical perpetual calendars needed adjustment through the use of correction buttons or pushers. Kurt Klaus, a former apprentice of watchmaking wonder Albert Pellaton (of Pellaton winding fame), designed a synchronised caliber, using only a single crown for time, moonphase AND perpetual calendar adjustments. The Ref. 3541 introduced the perpetual calendar without the chronograph into the Portofino line shortly after the Da Vinci’s unveiling at Basel 1985 and subsequently, the handwound Portofino Perpetual Ref. 2050 would eventually, at 3.15mm take the throne of slimmest perpetual calendar at that time. Of course, all major technological advancement come with some costs; a manual winding perpetual calendar made resetting an issue as with a 24 hour power reserved tested for 30 hours, this hand-wound version always needed to be kept wound when an automatic version could have simply used a Buben & Zorweg to keep it ticking. Nevertheless, as testament to how robust such a complicated movement was, the Grande Maison herself, Jaeger LeCoultre, used the movement sans chronograph in their Odysseus Perpetual Calendar. With the Ingenieur Perpetual Calendar Digital Date-Month, IWC presented a watch case made of titanium aluminide ; widely in motorsport: the alloy is lighter and more robust than pure titanium. Last seen on the Spitfire Perpetual Calendar Digital Date-Month, the Reference 3791 represented the date and month digitally through apertures at 3 and 9 while the polished and satin-finished grey surfaces provided sophisticated contrast with the 18 carat red gold case. Unleashed in 2013, the IWC Ingenieur Perpetual Calendar Digital Date-Month driven by the 89802 calibre, basically takes the classic complication with traditional dressing and gives it the Ingenieur “scientific age” treatment. High tech modernism is conveyed through three semi-transparent totalisers which give new perspective to the perpetual calendar complication. Like the Ref. 3791 before it, the new Ref 3792 does away with the heritage moonphase accompaniment in keeping with the industrialist aesthetics. An ingenious calibre is at work in the IWC Ingenieur Perpetual Calendar. Every time the date display advances, IWC’s quick-action switch siphons off a little energy and makes it available at the end of the month. At the end of the year, thanks to the three semi-transparent totalizers, the entire dial is set in motion. Titanium meets aluminum with the 3792. It’s the first watch case made with titanium aluminide, the Ingenieur Perpetual Calendar is definitive of IWC’s reputation as one of watchmaking’s most prolific materials pioneers; coupled with a ballet of date, month and leap year counters visible through translucent totalisers, the synchronous change at midnight on New Year’s Eve reminds us of IWC’s horological mastery. In case the Swiss Schaffhausen’s competence isn’t yet self evident, there’s our review of the superlative Portugieser Digital Perpetual Calendar which will make our case solidly.